The Virgin Mother of God Is to Reveal Everything! 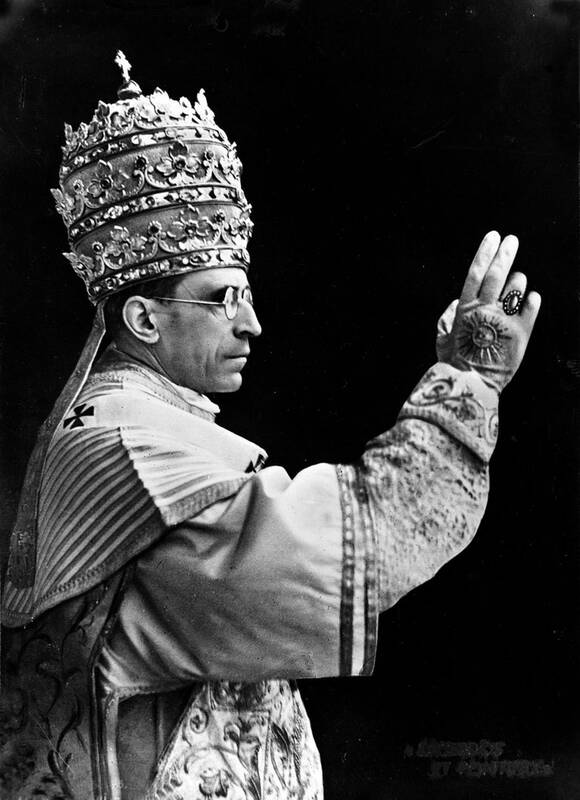 Pope Pius XII giving the Papal Blessing. The Papal Restoration will take place! “My children, says the Blessed Virgin, on February 22nd, I will leave to weep over the Eternal City, to cry over the chains of the saintly Pontiff, which are going to grow heavier; to shed tears together with him, my children, the last tears of the living Church, because sorrow is going to put it out for a while. That period is written down in Heaven; but men seem, within a short time, to be able to write it down upon earth. “My children, I will remain for five days weeping over that place. I will come back. Within a few days it will remain for me to reveal everything, without anything left closed or secret any more.” (February 7, 1882). [Source: p. 207, Prophecies of La Fraudais]. As I nurse a Christmas time cold, I am nostalgic for my mother’s care: the sympathetic companionship and regular checking to see if I needed anything, if there was anything she could do to make me more comfortable . . . Similarly, in this prophecy, the Virgin Mary, whose “fruitful virginity . . . hast given to mankind the rewards of eternal salvation,” (Christmastide prayer, The Little Office of the Blessed Virgin Mary), says that she will go to be at the side of Her Son’s threatened Church and His constrained Vicar’s side, “to cry over the chains of the saintly Pontiff, which are going to grow heavier; to shed tears together with him”. The year of this prophecy is 1882, and so the Virgin Mary is crying by the side of Pope Leo XIII (1878-1903), and the gloomy situation faced by the Hierarchy after the many losses against the Italian and French masonic enemies of Holy Mother Church during the previous pontificate of Pope Pius IX. “The Constitution of the Italian Republic, adopted in 1947, states that relations between the State and the Catholic Church "are regulated by the Lateran Treaties". “That period is written down in Heaven” by God the Father, who knows all. We can take comfort that this is only a “period” of time, and therefore, we will see an end to the sufferings of the Holy Pontiff, our Blessed Mother Mary, and ourselves. There will be Papal Restoration! If we take the place to be the Vatican, then the five days may be taken to be five Papacies: St. Pius X (1903-1914), Benedict XV (1914-1922), Pius XI (1922-1939), Pius XII (1939-1958), and the usurped Papacy of Gregory XVII (1958-1989) who, nevertheless, remained in the Vatican as “Cardinal Archbishop Giuseppe Siri.” Only with the continued exile of the Papacy, with Pope Gregory XVIII (1991-present), do we begin the era of a Papacy that is no longer physically present within the Vatican. But the Virgin Mother of God assures us: “I will come back.” And so, we know that the Restoration of the Papacy will occur. The Holy Father will rule from the Vatican, universally, once again. Truly, more facts are coming to the forefront every day, and more and more souls worldwide are waking up to the Truth of the masonic lies and the usurpation of the Chair of St. Peter. The devil and his minions have a limited time to deceive souls. The final triumph belongs to Christ, the Virgin Mary, the angels, and the Saints. May the Papal Restoration be soon!